HydroTac® Adhesive Foam dressing features AquaClear® gel technology. a bacteria-proof film backing, and a thin adhesive film. The foam dressing has a high moisture vapor permeability that helps keep dry wounds sufficiently moist and prevents skin maceration. HydroTac® Adhesive dressings are made of an adaptable soft foam. They reduce excessive wound exudate fast. They are comfortable to wear and won't stick to wounds and are painless to remove. They are cost efficient and economical due to long wear times. 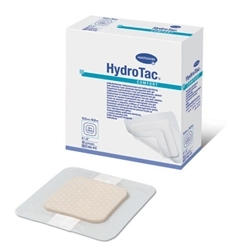 HydroTac® dressings are ideal for treating chronic wounds. Also for use in treating dry or exuding wounds. Available in two sizes: 3" by 3" or 5" by 5".